7 minutes from Disney this beautiful villa with privately screened Swimming Pool and Hot Tub is waiting for you! It is furnished in a contemporary style throughout and every conceivable item is supplied for you, including linens, towels, iron, cooker, dish washer etc. Twin beds in bedroom three plus PlayStation2 and games to keep the children amused. Twin beds in bedroom four, which is Disney Princess themed. There are child safety alarms on all doors out to the pool. The villa is fully fenced, giving total privacy. NEW GAMES ROOM JUST ADDED! - Pool Table, Air Hockey, Foosball Table, Darts. This stylish Villa has been designed for maximum comfort and relaxation during your vacation. Why stay in a hotel when you can have the luxury of coming home to this peaceful, spacious and exclusive villa. The Villa will be professionally cleaned prior to your arrival. The villa is fully fenced for your privacy. Telephone is available for free local calls. RELAX BY OUR REFRESHING POOL. The community features basketball courts, putting green and children's playground. Great place for large family! Owner was very responsive! I didn’t originally add the pool heat to my stay, however we found we needed it. He had someone come right out to turn it on. The place is large enough for multiple families. The house is only 10 mins to the parks ! Will absolutely be booking this house again when we come back! Very clean and tidy.. however, in saying that, it does need a bit of TLC in some areas.. wobbly fan in one of the bedrooms, looks like it's going to fly right out of the ceiling. Ceiling fans very dusty. A lot of window blinds were broken/missing. A few lights didn't actually work. When we arrived we had to clean the pool out ourselves, as the person before us left massive clumps of long black hair in the pool (lots of it too!) it was disgusting! Was so excited about using the hot tub, but very surprised that no chlorine is used in it at all, meaning the water was always stale/mouldy smelling.. so we didn't use it after the first couple of days as it made our costumes and our skin smell mouldy! The owner was really nice. We were here during hurricane Irma.. he kept in touch with us throughout making sure we were ok and helping us in every way he could.. we are considring coming back here next year. Great location as well. Would stay again and would recommend this place, it just needs that bit of TLC. Could use upgrades throughout. Was nice and clean with lots of towels, kitchen utensils, and bedding. Hot tub is tiny. Backyard fence is broken in several places. Game room is missing darts and several of the tables are broken and held together with tape. Cable in house has extremely limited channels and about 1/3 of remotes work even after we replaced batteries that we purchased ourselves. Overall if other houses are available for same rates I would try them instead. We always take reviews seriously and are dissapointed that this guest had the issues noted..we were not made aware of any issues about the remotes by the guest so we could have addressed them .. The TV has the Brighthouse/Spectrum HD Plus line of channels - with DVD included. The Games room Table was damaged by a recent guest and will be replaced once we can locate one. Ok, the property is a bit tired as far as furnishings but clean and good value for the price. The space was great for the 6 of us, the pool is a good size and the separate jacuzzi is a bonus. Very good and quiet location, not far from the parks. Wayne very helpful. The owner responded promptly and made booking and instructions simple. Easy to get too , close to WDW.. privacy and very spacious if you have a large group! 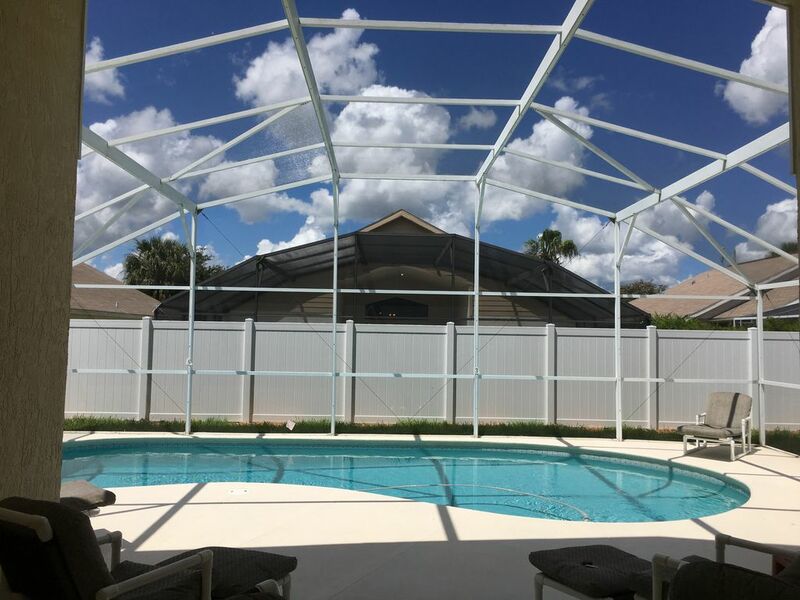 The Villa is located on the Indian Creek Subdivision, in the Formosa Boulevard area, literally 5 miutes to Disney and is close to shops and restaurants and only 2 miles from highway 192. Orlando International Airport is within a 20-30 minute drive.